I grew up in the 1950s and 1960s reading books about the dinosaur “orthodoxy.” According to this traditional view, the dinos died out at the end of the Cretaceous because their beloved swamps dried up and the air became too cool. But the new conditions were perfect for us quick-thinking Mammalia, so we took over, along with the other hot-blooded class, feathered birds. That was the Official Scientific View until the 1970s. Whew! It’s hard to believe that four decades ago paleontology could be so very, very wrong. Today we know that Tyrannosaurus rex was not a big lizard. It was the 10,000-pound roadrunner from hell, clothed in fine feathers. Tyrannosaurs and other dino-clans ranged far north and far south and survived icy winters just fine. 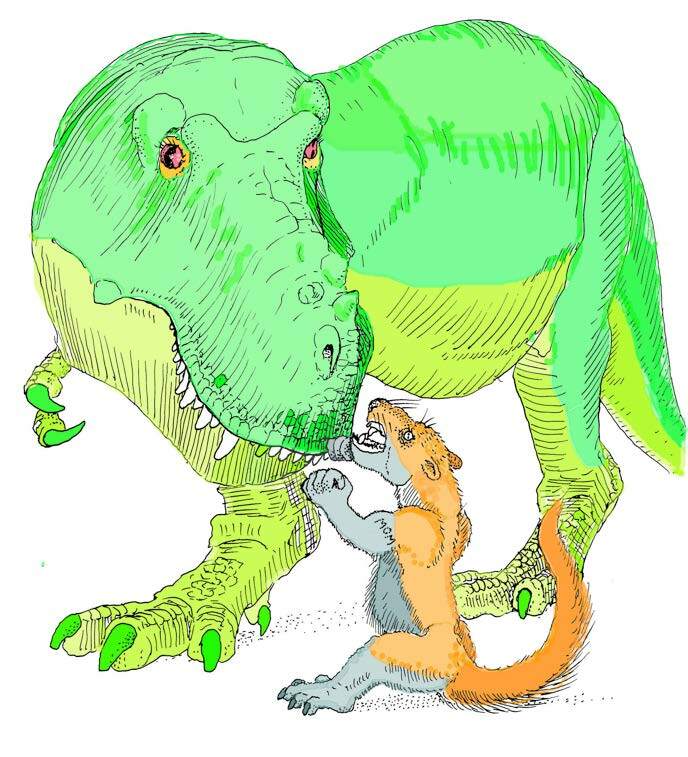 We mammals were kept small all through Mesozoic times because the dinos, on average, were faster on their feet, quicker in their jaws, and had better hearts and lungs. Dinos won the roles of top predator and top herbivore fair and square. The humiliating truth is that we mammals are the class that won by default, taking over only because some external event removed our dinosaurian overlords. Face the facts friends: we are furry carpet-baggers. Question: Who first discovered that dinosaurs were part of the hot-blooded bird family tree? Was it Dr. Bob Bakker, your faithful curator? Aww, nice of you to ask, but the original hot-blooded-dino guy was long before my time. How ‘bout Yale’s John Ostrom, who dug up the raptor Deinonychus in 1964 and linked raptor-dinos to the early bird Archaeopteryx? Was the first dino-bird chap Thomas Henry Huxley, the pugnacious defender of Darwin in the late 1860s and 1870s? Huxley, who coined the term “agnostic,” was a favorite of my advisor at Harvard, Stephen J. Gould. Huxley did point out that hips and shoulders of dinos were very bird-like, and so were feet. Therefore, Huxley argued, some sort of dinosaur-oid was the ultimate ancestor of the bird class. But no again. Huxley was not the first to see bird-ness in the dinosaurs. served on the Board of Fisheries. Got your notebook ready? Here comes the answer, and it makes most museum-goers raise an eyebrow. 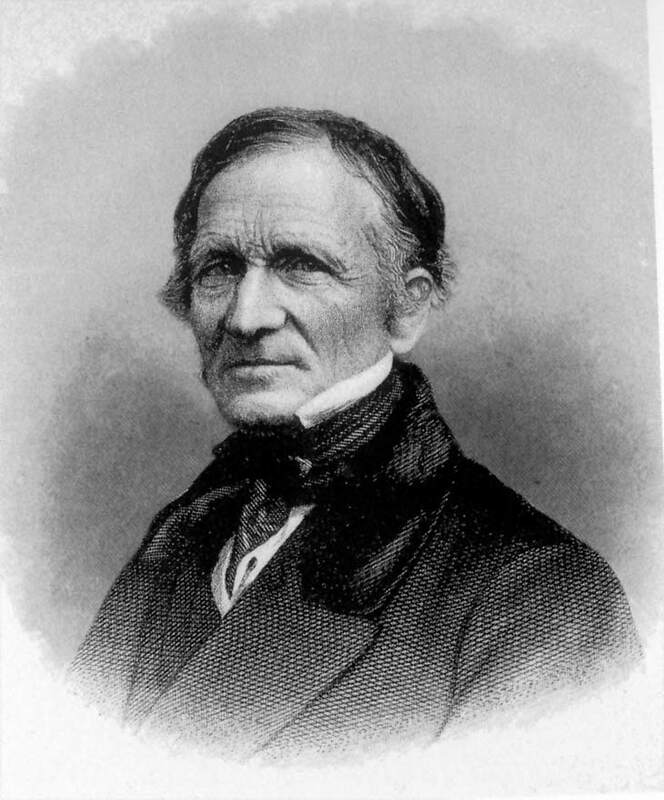 The true discoverer of feathered dinos was… the Reverend Edward Hitchcock, State Geologist of Massachusetts, Professor at Amherst College, philosopher and Congregationalist pastor. Hitchcock figured out that dinos were a subclass of birds as early as 1838 — four years before the term “dinosauria” was invented! wry sense of humor and boundless joy in science is evident. How many skeletons did Hitchcock dig up? None. Not a one. But surely his lab got many well-preserved parts of dinos, right? Nope. Only after he retired did a partial skeleton show up, blown to bits by gunpowder used to excavate a well. Hitchcock came to the fundamental truth about dinosaurs entirely from fossil trackways. Across the pond at Oxford, Hitchcock’s colleague, the Reverend William Buckland did dig hundreds of Jurassic and Cretaceous bones and some pretty good skeletons. The Oxford fossils inspired Buckland’s student, Richard Owen, to come up with the name “dinosaur” in 1842. Sad to say, neither Buckland nor Owen realized that their restorations of dino skeletons were, in today’s parlance, “bass ackwards” — they put a huge bone in the shoulder, giving the critters a clumsy muscle-bound look in the forequarters. They didn’t realize that their “shoulder” was really part of the hips. Hitch*, on the other hand, without a single well-preserved osseous specimen, scrutinized the footprints and got dinos correct, fore and aft. under Richard Owen, with gigantically distorted forelimbs and flat feet. Painting by Luis Rey from our Big Golden Book of Dinosaurs. Hitchcock and Buckland were members of the “Pious Paleontologists,” thoughtful scholars of the early 1800s who took the record of the rocks and the record of Scripture seriously. Hitch was persuaded that earth history, written in pages of shale and sandstone, would make everybody better, more intelligent citizens. He wrote a delightful book for his Congregationalist flock,The Religion of Geology — probably the finest rumination of how rocks and fossils can be integrated with piety. Hitch won the reputation as an inspiring lecturer at Amherst. 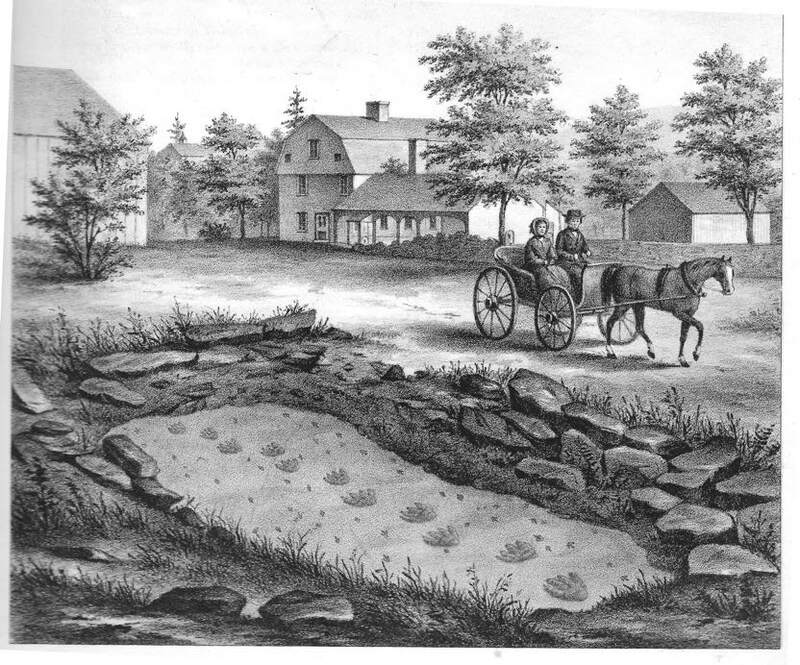 Emily Dickinson, among many others, was enraptured by the stories of prehistoric New England and how the past had shaped the woodlands and gardens of the present day. Hitch and his crew found petrified remains in these beds: some fern-like fronds, stems of horsetail reeds, bits of fish and a magnificent bug, the larva of some ferocious water insect. The red rocks had petrified weather, too: some surfaces had the delicate pattern of raindrops. Others showed deep cracks produced by prolonged drying. But the most abundant remains were tracks, thousands of them. 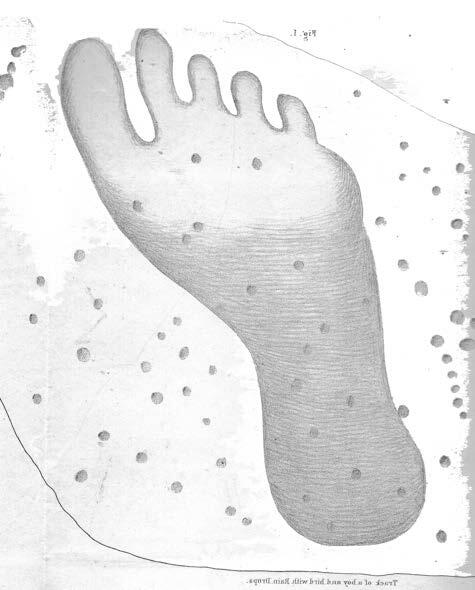 Some of the littlest footprints were made by flat-footed, lizard-oid critters with long, supple toes in fore and hind paws. Much more common, and often of giant size, were tracks made by somebody very different — mystery animals who grew as big as elephants and shared a common body plan that kept Hitchcock’s powers of deduction busy for his entire career. It was a great quest — he was on the trail of the creatures who ruled the Jurassic world on land. the local farmers using the one-horsepower field vehicle to visit the site. Hitch pondered the prints made by the mystery toes. Almost two centuries before Microsoft and Apple, Hitchcock began a digital revolution, inventing new methods of deciphering the details of paws. 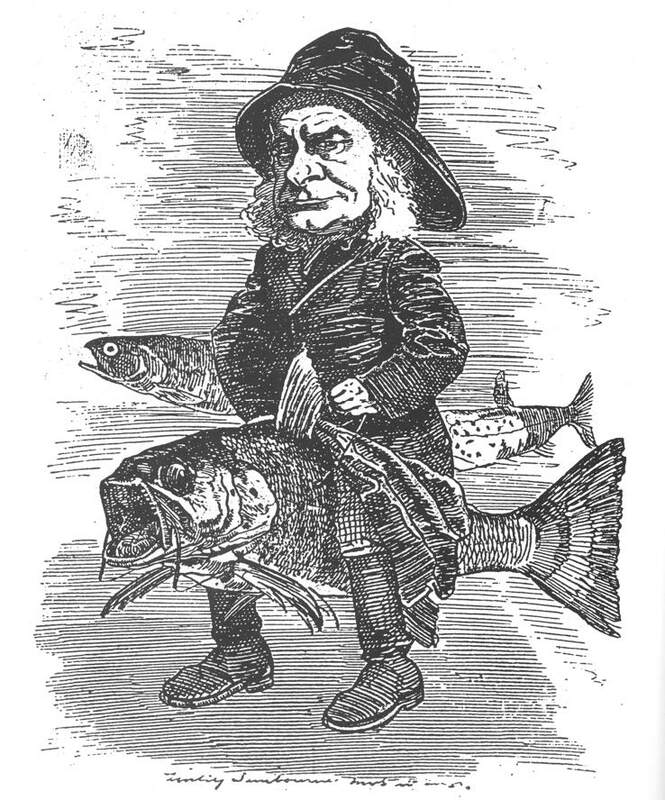 He and his son scoured libraries for anatomical details of the class Amphibia, the class Reptilia, and the hot-blooded classes, the Mammalia and Aves. Then they ran digital experiments, chasing all manner of animals across muddy fields — including barefoot boys with cheeks of tan — so they could draw the arrangement of toes. All this research gave the Reverend Hitchcock more insight into the animal sole than anyone had obtained before. Step by step, Hitch filled a dossier of clues that would lead him to a final identification. Barefoot boy track as drawn in Hitchcock’s great monograph. Little dots are raindrop impressions. Hitch found drop marks on rock slabs with the mystery monster tracks. There was no evidence, pro or con, that the boy or the monsters carried slingshots, a la Bart Simpson. First Clue: Bipeds. Nearly all the mystery tracks, even the biggest, were made by animals walking on their hind legs alone. That was unlike the locomotion of most lizards and mammals. 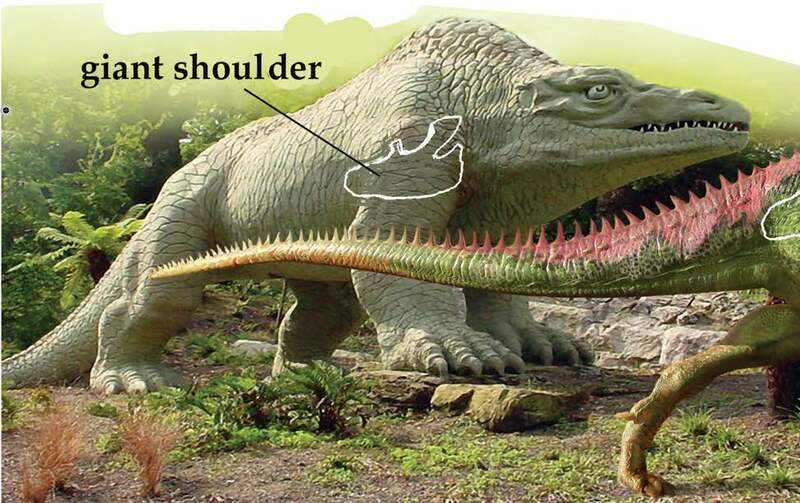 And unlike the way dinosaurs were restored — with huge shoulders. Second Clue: Toe-walkers, not flat-foots. Usually there was not a trace of the heel so it must have been held high off the ground. That eliminated dinosaurs because the dinos were flat-footed — so said the brightest and best of Europe’s bone-sleuths. Third Clue: Long Achilles tendons. This clue was the biggie. Over 99 percent of the tracks showed nothing of the ankle and nothing of the front paw, because the mystery beasts were strict toe-walkers. But in a precious few fossils, the tracks captured the mystery animal as it squatted down on all fours to drink or sniff the earth. Marvelous. The entire backside of the ankle was pressed into the mud — the Achilles tendon wasn’t wide and flat like a lizard’s. It was gracefully elongated and slender. The front paws were tiny, five-fingered and carried short, sharp claws. Maybe there was a mark left by a stumpy tail — the track wasn’t clear on this point. Hitchcock’s mind raced. 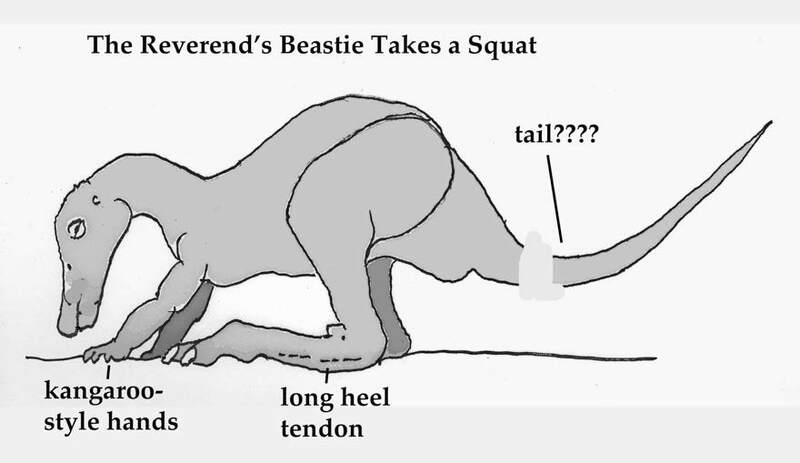 What prehistoric monsters had ankles and front feet built that way? Not mammoths or rhinos. Those giant hairy beasts always had front feet wider than the hind, and the ankle was always short. Well then, what about frog-oids? 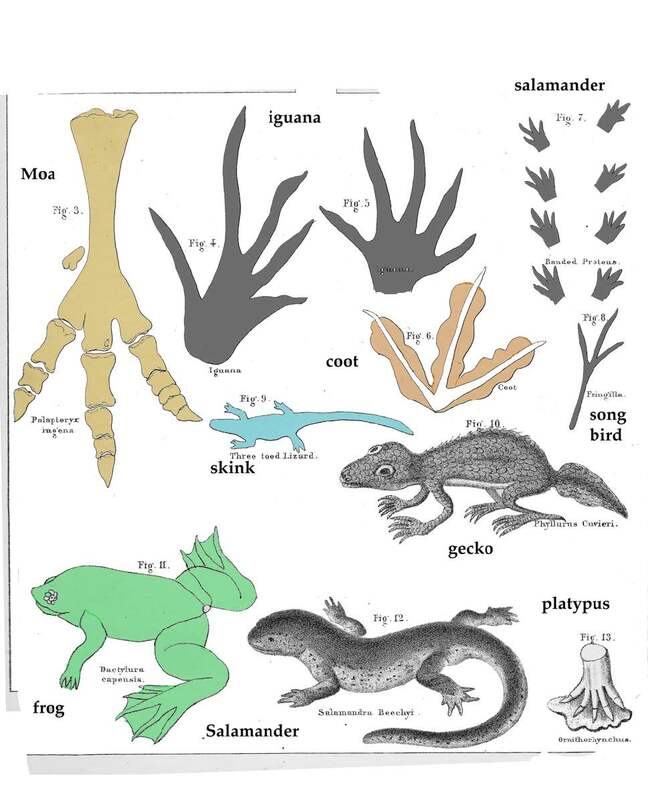 The hopping amphibians did have long, powerful hind limbs, strong calf muscles and small hands. The thought of multi-ton froggies stomping over the Jurassic meadows was … well, weird. And exciting. 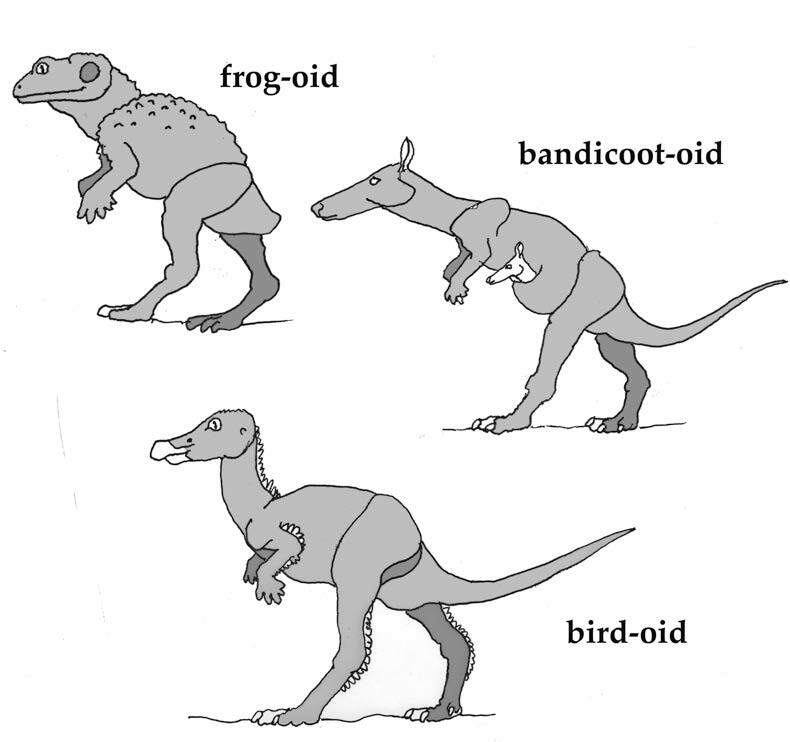 If not frogg-oids, mebbe … bandicoot-oids? Australia was famous for “low-class” mammals, the marsupials, which on average were smaller in the brain than antelope, deer and other “normal” mammalians. Kangaroos and bandicoots had enlarged rear legs with super-strong calf tendons — plus little hands. Therefore, Hitchcock had to take seriously the idea of Massachusetts being overrun by Jurassic bandicoots bouncing about, as big as bull African elephants. … and Hitchcock could feel that he was getting close to the final answer. He needed just one more new type of CSI analysis, a quantitative sole-searching that would finger the culprit and reveal, once and for all, the identity of the Jurassic rulers. 1858. Paleo-podiatry would enable the Reverend to solve the mystery of the Jurassic tracks. Er, no. There is progressively more and more evidence that Mesozoic synapsids were a diverse bunch. If we “won by default”, then dinosaurs won by default after Trucidocynodon and kin died out.